“I also think that we need to look at this issue of it being judgement day as it relates to the churches. I am still dumbfounded, and here I am critic of myself who is intimately a part of church life and don’t know myself outside of church life, of how silent the church continues to remain in situations like these,” Mr Skelton-Cline said on his show Honestly Speaking, aired on ZBVI 780 AM on October 10, 2017. 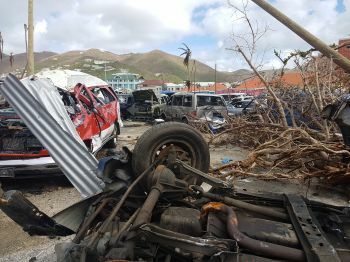 Mr Skelton-Cline, who had Opposition Leader Hon Andrew A. Fahie (R1) as his guest, was at the time addressing some of the issues arising in the aftermath of Hurricane Irma that devastated the Virgin Islands on September 6, 2017, including the alleged unfairness in distribution of relief items and price gouging. “Irma in particular was judgement for the BVI. This is not happenstance, this is not accidental, it was a judgement,” Mr Skelton-Cline stated, adding that the VI has to learn whatever lesson was intended. Let the filthy be filthy still? The former Ports Authority boss particularly spoke out against businesses that engaged in price gouging following Hurricane Irma. “Two things have been pronounced to me. In times like these one or two things happen; either we become more of who we already were before Irma, so if you were greedy before Irma you become more greedy; and that’s why we see this tremendous amount of price gouging, where people were being taken advantaged of in their most vulnerable situations. It was at this juncture that Mr Skelton-Cline expressed disappointment with the silence of the churches in post Irma. “How can you be the moral voice that speaks clearly and lucidly about what ‘thus sayeth the Lord’? How do you have the spirit of the sons of Issachar, who has an understanding of the times, so that they know what the Virgin Islands have been? How do we keep from surrendering to whatever Government by whatever letters? 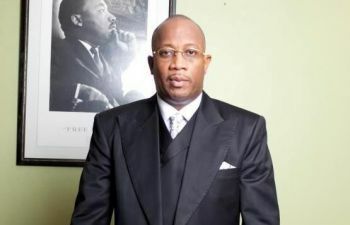 You, me as men and women of God ought to be the mouth pieces of God that speak truth to power no matter who the power is, whether they are our friends or our family,” Mr Skelton-Cline stated. Reports about price gouging have been rampant following Hurricane Irma, including on items such as generators, gasoline, groceries and electrical items. It was a judgment on Claude's tenure as CEO of the massively corrupt pier port project! what a lot of rubbish...blaming other islands hit by devastation as well..they deserved it...oh my, where is "Global Warming" in this diatribe...?????????? Judgement is right because there is far to much wickedness in high places, Aka white collar criminals easily moving our tax money from point "A" to "B" and nothing while the guy on the block spends jail time for 10.00 worth of weed or even less: million of tax dollars in this place untraceable(who gone jail..no not one)....judgement is JOKE!!!! We all can begin with self examination, you included "man of God". Irma shook my faith too and I am still searching for answers but I am not convince this is God's doing. I am more inclined to believe it is man's (sinful flesh and greedy ways) and the devil's doings. We no longer care about each other, the environment and the land the Lord lets us occupy. Our fore fathers knew how to care for the land even if they had more than their neighbor you didn't know notice it, because they didn't drive, wear and live in it. They didn't separate their children from the neighbors because they thought they were better than them because they made more money than the neighbor. They didn't misuse government property or employees and their positions for self gain. So everything listed are acts of human letting the devil influence them through hatred and jealousy and trying to create a society of haves and haves not. BVI has too many vehicles, too many people believe they have to drive and live their income and more through debt. They thumb their nose at others, yet we don't like our inner selves. The homes and business they/we build cannot hold their/our egos, but destroy the land and environment. If anything is to be take away from Irma, Maria and the floods is that the Lord is teaching us that it is better to live a life of modesty, loving your neighbor and caring for one another... the rest is the devil. So stop blaming God. Build smaller, spend more time with your children and family, contribute to community and enjoy the blessings of the natural state of the beauty the BVI offers. You can build a neat shack and keep around it clean and it will still look nice in the BVI...You know why? Because the Lord already kissed the BVI by blessing it with natural beauty that shines through the surrounding water, the native plants and people the lights up the land with various colors. So stop and learn to appreciate the simpleness! Amen!! Thank you for your comment. I pray that others will heed it. I certainly will. what? even if they not bahn here? Read your bible... it tells about theses things. The last days. I read my Bible and although "its tells about these things". The last days" as the Adventists (of which I am one) and other Christians are quick to remind the rest of world as if God gave us only that special calling; I don't know what the Bible you are reading says. However, the one I read also tells me in Matthew 24:36 - "But of that day and hour knoweth no man, no, not the angels of heaven, but my Father only". Same says Mark 13:32 except it added "neither the Son, but the Father". Translation...if the angels and the Son doesn't know neither do Claude, you, nor I know whether God cause the disaster or if Irma, Maria and the floods are signs that we are living in the last days. My Methodist, great-grand and grandparents thought the same back in the day when things were really really hard in the BVI. We, the Adventist have been saying this since Ellen G. White's days "signs of the time", yet several generations later I was born and the world did not end. What I do know is that I have witness the ugly, arrogant, selfish, and foolish stuff that has permeated the BVI and we have caused damage to the environment with our selfish got have everything now ways. All of us, Christians or not, need to stop pretending we can read God's mind and focus on being our best selves and love one another. God gave us the magnificence of his creation, dominion over it and intelligence. He made us in his image, able to create. We learned to enhance his creation and through science, we humans reduced infant mortality and increased life expectancy. But we are still children, short sighted and living in the now. We forgot that with our intelligence and dominion come stewardship to the planet as commanded in Genesis. Here, we have failed to foresee that the changes we have wrought require attention to resources and repercussions. Irma is one of the repercussions of our lack of foresight. She was plain and simple, a result of climate change- a great failing of human stewardship to the Lord's creation. but let's be careful- let's not allow only a few families to control this gift- God's gift to us ALL. It was a catastrophic storm yes, but a storm borne by the natural action of redistributing the worlds heat. That’s a hurricanes job, it’s what they do. There is no evil, it is simply a natural event that was more powerful than anyone could fully prepare for. Your free advice is worth just what I paid for it, nothing. Your not a leader of men, your a noise maker. Here is a clear case of "talking loud & saying nothing. " a supposed person of the cloth critical of his own. What's despicable is that he as one of them himself has NOTHING to offer. Apparently brother, you just want to be seen and heard. B gone thou hypocrite! Fool if your house no bump that if your castle still standing then it wasn't enough JUDGEMENT. yes well said we all need to come together . Be there for one another , LOVE one another, STOP all the hate. It makes me CRY to see how we TREAT one another. GOD IS GOOD HE WILL NEVER LEAVE US HE LOVES US PEOPLE U EVEN DONT KNOW. SO PLEASE HAVE A HEART LOVE GOD AND U WILL SEE HOW EVERYTHING WILL BE GOOD . I LOVE U LORD I LOVE U I JUST WANT TO SAY THANKS FOR EVERYTHING .